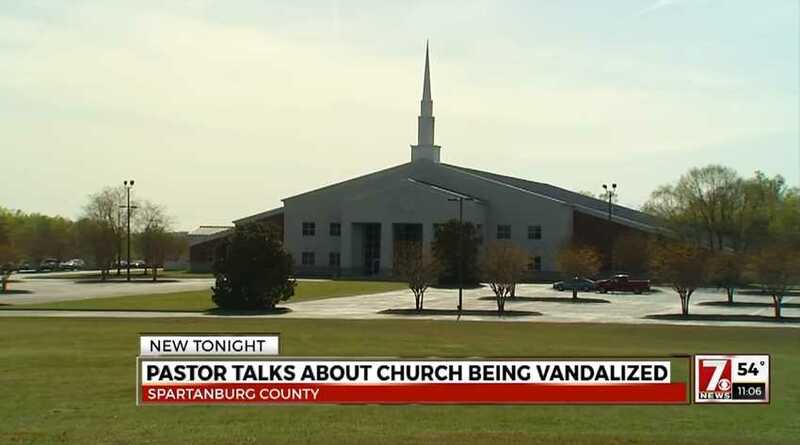 INMAN, S.C. — Two teenage boys are believed to have vandalized a South Carolina church on Wednesday, smearing food throughout the kitchen and throwing knives into the wall. “Idle hands are the devil’s workshop,” Brad Atkins, the pastor of Lake Bowen Baptist Church, told WSPA-TV. Atkins entered the church on Thursday to find chocolate sauce, caramel, jelly, sprinkles and snow cone syrup strewn all over the floors and walls in the kitchen. Dish soap had also been squeezed out. “Every two liter drink we had, they dumped out [and] poured it on the floor,” Atkins explained. There were also several knives stuck in the wall, with other holes that indicated that the vandals threw them numerous times, possibly having a knife-throwing contest. Surveillance footage from Monday showed two teenage boys riding around inside the church on a buggy for children. That night, the teens also sprayed whipped cream both inside and outside the building, and they went into a classroom for children and wrote lewd words on the chalkboard. Atkins believes that the same two boys came back on Wednesday night and committed a second round of vandalism. He said that the teens were likely on Spring Break, and lamented the kind of acts that youth commit when they are left to themselves. “It’s very frustrating because … [these are] some of the very people in our community that we’re trying to reach with the gospel and to love on. And to have them come in and do something like this, it’s frustrating,” Atkins told WYFF-TV. Police have fingerprinted the knives that were stuck in the wall, as well as other items. In addition to general clean-up, Atkins says that the sheetrock will have to be repaired. WSPA-TV asked Atkins what he would say to the vandals. “What these young men did was wrong, malicious, and destructive, and they will have to give an account for their actions, but God’s grace and forgiveness is available,” Atkins stated.